Nice Andy, very nice indeed, I like it. Someone near me must have recently acquired one, I see it in daily use frequently, in red. Can't wait to pass it in the Capri. I'm interested to know, how are car prices and parts, are they rocketing like the Capri's and parts have done, or are they more reasonable still. pbar wrote: Nice Andy, very nice indeed, I like it. but I suspect it's only time. Thanks Andy, it's good to know that it's not the whole classic/Ford scene which has gone silly. If the Capri scene ends up out of the range of the everyday person which they were originally aimed at, then there are classic alternatives at least! pbar wrote: Thanks Andy, it's good to know that it's not the whole classic/Ford scene which has gone silly. If the Capri scene ends up out of the range of the everyday person which they were originally aimed at, then there are classic alternatives at least! To me, engine wise this is a Capri but wrapped up in a different body style....Albeit a little more practical. Which one are you taking to Simply? Hang on........what's happened to the Fiesta? Andrew 2.8i wrote: Hang on........what's happened to the Fiesta? Due to slight storage issue it's gone to a new owner.....Sierra is a better all round car anyway. andyd wrote: Sierra is a better car anyway. Nobody will argue with that! You did well to find a good low-mileage example like that. 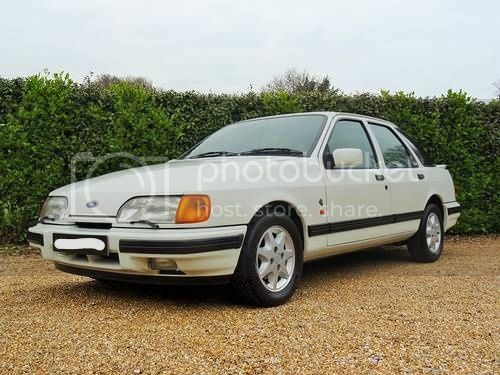 Well.....I saw the car about a year ago when I had the CRX, and was trying to sort out a deal with the dealer, when someone came in with the cash and beat me to it Anyway the car reappeared at the same dealer in November by which time I had the XR2. So I enquired again and he remembered me, we did the deal and that was that. 1.6, bet that was quick Sierra's have grown on me over the years, not all about the Cosworth's either. Very nice Andy, you do manage to find classic ford's in stunning condition. Don't know the last time I've seen one of these, must be quite rare now. 4x4 & 2.9L power, what's not to like. I have on many occasions contemplated getting rid of the Capri for one of these as i love Sierras, especially the Sapphire model. My dad had a 2.0 EFI GLSI back in the day and it was a beast. Even out dragged a sapphy Cosworth off the line one time, he soon caught up once he was on boost mind you, but still it was an awesome car. We drove all the way to Spain in it towing a caravan full of our belongings once. The Sierra's suspension was practically on the floor from the sheer weight, but it still never missed a beat and got us there without complaining once! Sadly when we sold the car we saw it ended its days due to a severe rear end collision...bloody moron must have spun it into a wall or something, twit. 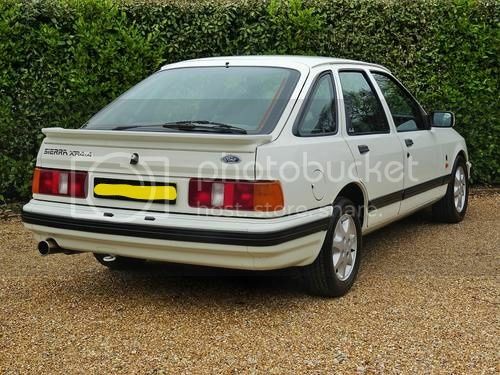 Im surprised these haven't fallen victim to the skyrocketing price and insane cost of parts epidemic Capris have, thats good news if i ever need to get rid of my Capri (which i dont ever intend on doing mind you), at least there's affordable alternatives out there for classic Ford fans. Caprifan Rob wrote: Very nice Andy, you do manage to find classic ford's in stunning condition. Don't know the last time I've seen one of these, must be quite rare now. 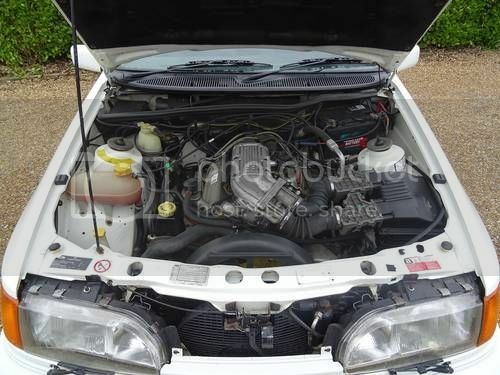 It was up at £9995 several weeks ago.......If it was a V6 Capri in this condition etc it would be at least £15K. Ah yes, sounds like heaven. Thats still good money, but nothing compared to what Capris go for like you say. Kinda wish i had kept my old 2.0 Sapphire now...it was a long time ago...i think it was a "1000e" type variant of some kind, or something like that. That looks like a real nice example of a 4X4. They were cracking cars and still are today. Never owned a 4X4 but had a 2 year old 1.6L in 1985, a 2.0GL in 1988 and a 3 dr Cossie in 1989 which I had for 6 weeks then it was nicked. Gave up and bought a Merc 190E after that! The last Sierra i owned was a 1988 1.6L which i bought with two months MOT and Tax in 2002 for £25. Ran about in it till the T&T ran out then broke it up to build my Kit Car from it. That's still running well so they live on forever!